Join Alaskan big game guide Billy Molls for an Alaskan moose and caribou hunting adventure. Arctic Antlers is all Alaskan moose, caribou, and as a bonus, 2 wolves are also taken. See moose by the ton and caribou by the hundreds! 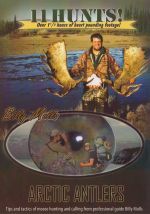 Over 3,000 inches of antlers are harvested on this DVD! Watch as Billy calls these giant bull moose right into his lap! Billy also shares some of his personal secrets on moose hunting and calling that he has perfected in his 12 year guiding career. Billy has spent over 500 days hunting moose and caribou in the great state of Alaska, and the highlights are shared with you on this 90-minute video.